The king of Champakvan, Maharaja Sher Singh was under a lot of stress. He stopped visiting the royal court. He just stayed in his chambers, lost deep in thought. He no longer ate or slept properly and barely spoke to the other Ministers. Such questions spread across the kingdom. The people too were feeling no better. The king had given strict orders not to let anybody disturb him. 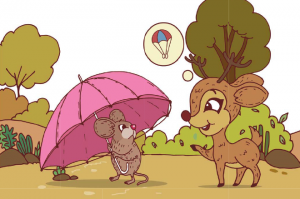 Animals who set off in hopes of cheering the king up returned disappointed. 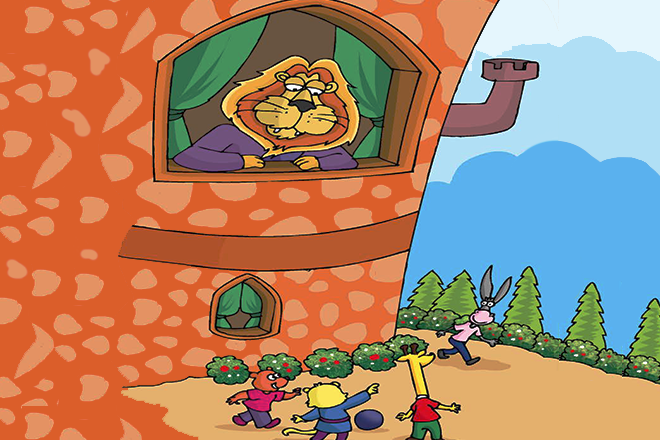 One day, the king was standing by his window. He enjoyed standing there as the greenery that surrounded his palace made him happy. Below his window, he saw children playing. Samba, the cub was one of them. “Let’s send him to the palace,” said the rest of the gang. “Oh Damru, we’re so glad we found you. We’ve been looking everywhere for you. The king wants to see you immediately,” said Samba. “We’re not sure, but we heard the news from the Ministers that the King is looking for a new Minister. Your name was being brought up a few times. They asked me to go fetch you,” said Samba. “Wow! Do you know what this means Damru? The king wants to make you his minister. 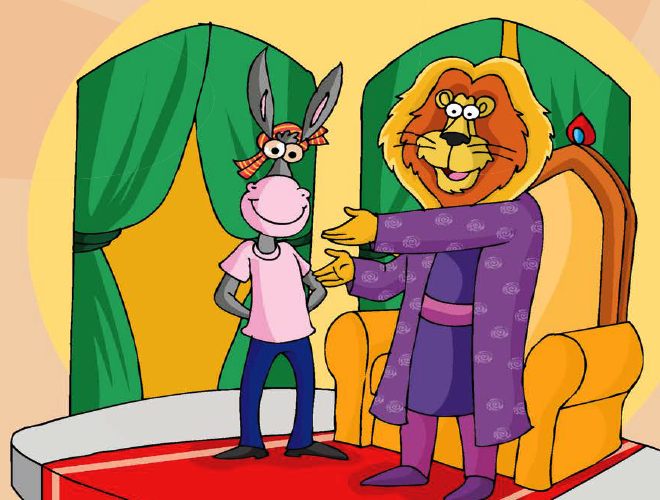 Go meet the king at once!” said Lambu, the giraffe. “We will be waiting for you right here. Don’t forget to bring us sweets!” said the children. The king remembered it was April fool’s day. He thought of his days as a young cub and all the pranks he had played. They stirred such strong memories that he too began to laugh. His laughter grew louder and louder. A Minister ran in to the chambers hearing the commotion and found the king holding his stomach and gasping for air. 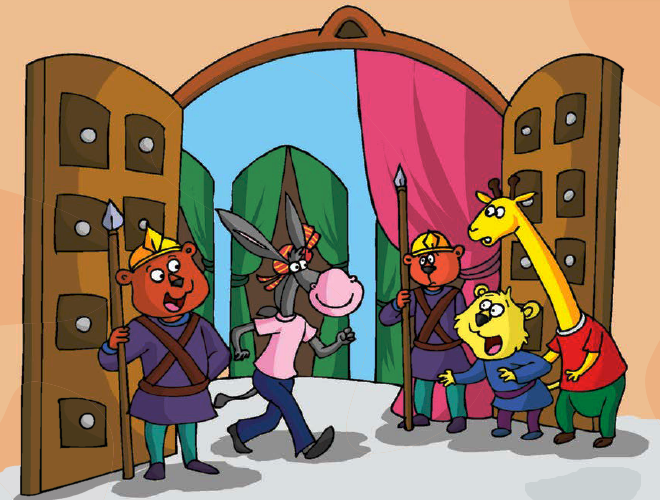 The guards quickly stood in attention and allowed Damru to pass. They walked together in to the royal chambers where the king waited. When he saw Damru, the King couldn’t help but smile. Damru felt a little uneasy. Damru was so excited, he could barely control himself. He jumped with joy and danced around the room. Meanwhile, outside the children were getting worried. Damru had still not returned. They hoped something bad hadn’t happened to Damru. They waited for him by the palace entrance when the gates opened. The guards announced “Make way for the Royal Minister of Laughs” and out walked Damru. The children were both shocked and surprised; Damru had actually become the king’s minister. Soon, the news of the king cheering up spread like a wildfire and all the animals of Champakvan ran to the royal court. Damru entertained them and soon, the entire forest was back to being happy. Once the celebrations had drawn to a close, Maharaj Sher Singh addressed the gathering. 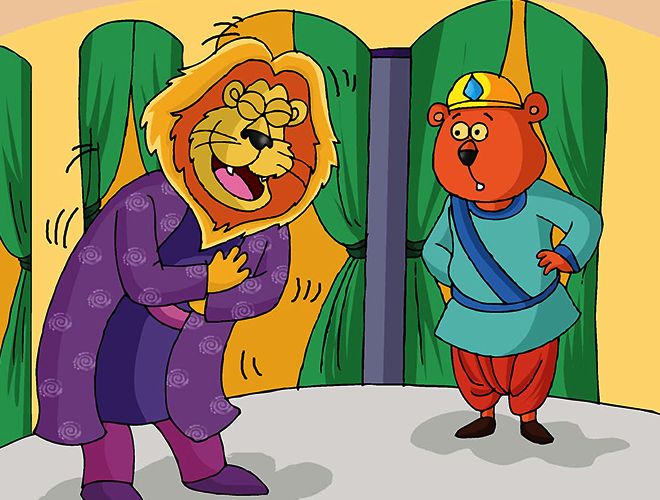 From that day onwards, Damru always kept the king in a good mood. With a happy ruler leading the kingdom, Champakvan prospered.